Portland at Syndicate: Why My Bookshelf is Full of Books I Haven't Read... Yet. Why My Bookshelf is Full of Books I Haven't Read... Yet. We're definitely a reading household. We have hundreds of books scattered around and guess what? We haven't read three quarters of them. This sounds really weird to a lot of people. I tend to read a book and immediately give it away to another friend, family member or colleague to read. I "lend" books without ever intending to get them back. So if I've read it, it's probably going to leave our house forever. The second thing is that I'm not big on re-reading books. I know a lot of people who are avid re-readers and they find meaning and comfort in reinterpreting a book that they loved within the context of their life as it is now. I have major book FOMO, there is so much amazing literature and if I re-read I'm missing an opportunity to experience something new. So now to why our bookshelves (and lots of other surfaces) are covered with books we haven't read. I'm a little bit of a book hoarder, I like to collect all of the books that I hope to read someday. It also helps that Magers and Quinn is one of our favorite places to kill time in Uptown. Having all of these books around means that whenever I walk over to our shelf I can easily find something new to read. I love that our messy shelves are a place where surprise, discovery and growth are just waiting. 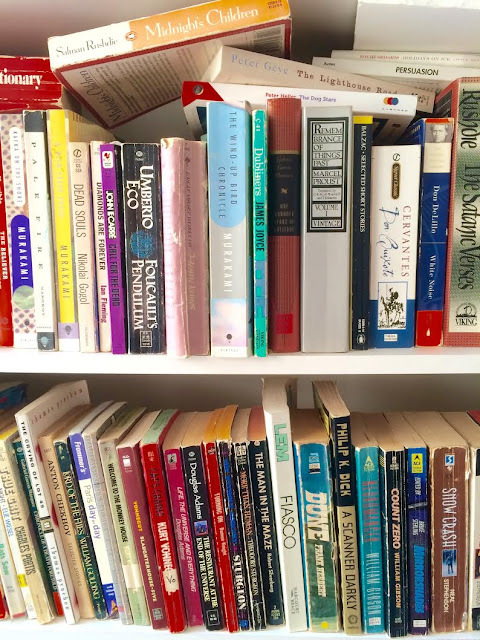 Do you like to keep/re-read your books or are you a well-meaning hoarder like me?